Health professionals from migrant backgrounds bring new ways of seeing and doing that can innovate practice, but differences are often framed as a deficit rather than a strength. The 2016 Autumn edition of the Hive (the Australian College of Nursing’s quarterly publication) focuses on indigenous and multicultural health.The wonderful Janine Mohammed, Chief Executive Officer of the Congress of Aboriginal and Torres Strait Islander Nurses and Midwives (CATSINaM) has written a commentary on Indigenous health and I invited some great health professionals from different backgrounds to reflect on what their cultural background and life experiences bring to the world of health. I’ve also written a commentary on the multicultural aspects of contemporary health care practice. You can download a pdf version of Embracing uncertain ground or keep reading! Reproduced with permission: cite as DeSouza, R. (Autumn, 2016). 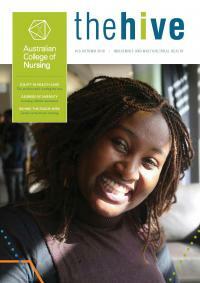 The Hive (Australian College of Nursing), 13 (13). The word ‘translation’ comes, etymologically, from the Latin for ‘bearing across’. Having been borne across the world, we are translated men. It is normally supposed that something always gets lost in translation; I cling, obstinately to the notion that something can also be gained – Salman Rushdie, Imaginary Homelands: Essays and Criticism 1981-1991. Salman Rushdie writes in Imaginary Homelands about being a migrant and the uncertain and shifting territory that accompanies it, making one’s identity both polar and partial. Sometimes one straddles both the country of origin and the new country comfortably, and at other times falls in the space between (1992, p.13). Rushdie challenges the notion that migration only represents loss, and suggests that the uncertainty of migration and settlement can reinvigorate new spaces. The migrant is changed by migration, but the migrant also changes the worlds they enter. The uncertainty that accompanies the migrant is also processed by the receiving society. Here, however, uncertainty and unpredictability are often viewed as a loss and threat, rather than as spaces of possibility. My own work in cultural safety has advocated for those who are already at home to foster uncertainty. To effectively work cross-culturally requires engaging with our own cultural beliefs as well as those of others, and to consider culture as contingent, contested, negotiated and open-ended. A constructive and conscious examination of the culture of the health system that sees seemingly xed constructions as variable can yield new practices, resources, metaphors and practical strategies (De Souza, 2013). This special feature focuses on practitioners who are both translators and translated, who bring other ways of seeing things, and whose arrival has the potential to invigorate new thinking and practices. Contemporary health care is no longer a single national culture. In 2014, there were 610,148 registered health practitioners. Over half of whom (352,838) were nurses or midwives – over three times the size of the next largest group, medical practitioners (AIHW, 2014). More than half of general practitioners (56%), just under half of specialists (47%) and one third (33%) of nurses in Australia were born overseas in 2011 (The Australia Bureau of Statistics, 2013). Nearly 20% of nurses born overseas and one fth of general practitioners and specialists (both 19%) had arrived in the preceding ve years. Their countries of origin have also changed, where once the United Kingdom (UK) overwhelmingly dominated as a source country, an increasing proportion of overseas born nurses and medical practitioners come from outside Europe. In this new dynamic, the health system is transitioning from a command-and-control colonial institution to a responsive, agile and networked set of practices. Demands from consumers, carers, families and communities have required the health system to reorientate itself from being system-focused to be more patient and family centred. The changes in response to these demands are backed by evidence that doing so enhances effectiveness and quality. I served on the board of a large health organisation in New Zealand that emphasised the idea of the Triple Aim – enhancing patient experience, improving population health, and reducing costs – as a way of optimising health system performance. More recently, the three goals have been expanded to include a fourth aim to improve the work life of health care providers, as evidence shows that doing so also enhances the patient experience. This is particularly important as the toll a complex system exacts on the physical, emotional and mental health of workers is high, as seen in the levels of burnout. Australia’s health system, like those of other settler societies, was based on a colonial model of care exported from the metropole to the colony. Hospitals are recognisable wherever you are in the world, and have been imposed over indigenous modes of healing and wellness in the interests of modernisation. This modern movement was informed by the imbrication of Western scienti c and industrial knowledge, focused on ef ciency and effectiveness. In this factory model, people are moved through the universal health system as standard units of personhood and treated similarly in order to reach an identical outcome that assumed a homogeneous monoculture. In Victoria today, the most culturally diverse state in Australia, a quarter of our population were born overseas, originate from more than 230 countries, speak over 200 languages and follow more than 135 different faiths. The shift to patient-centredness in this context requires a broader range of skills. Professionals from culturally and linguistically diverse (CALD) backgrounds bring new ways of seeing and doing health that allow those of us working in health care to expand who we imagine the ideal user of health care to be. They bring different ways of knowing that are assets and which can help innovate the health system. The health leaders pro led in the following pages bring commitments to equity and social justice, a wonderful range of life experiences, and innovative ways of providing health care. Their inspiring work creates opportunities for the health system to consider new and innovative ways of ensuring the needs of diverse people are met.